Chemport is an ecosystem in which companies that are committed to developing a greener chemical sector can flourish. Companies, knowledge institutes and government together create the conditions for transformation and green growth of the chemical industry. 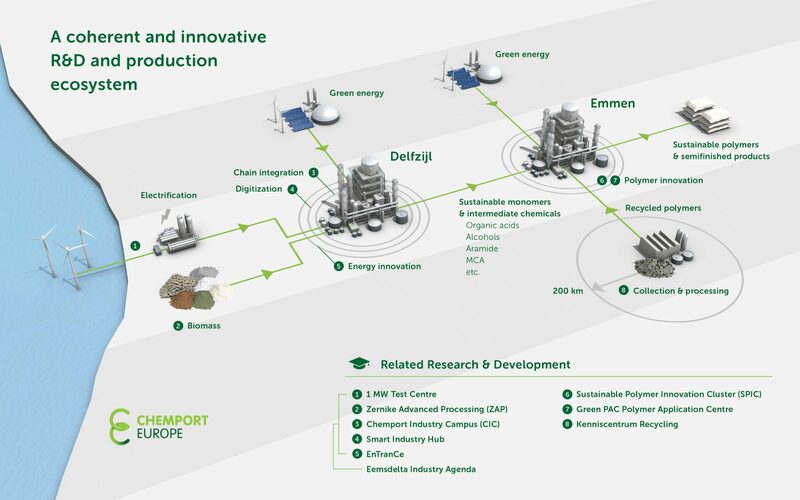 Chemport Europe has committed itself to focusing on sustainable and greener processes and products. This includes the use of green energy for large production processes. A pilot plant was opened at the Zernike Advanced Processing facility. There BioBTX is producing BTX from biomass. They also works closely with Teijin Aramid, towards producing bio based Twaron fibres. Discover our ecosystem. Our ambitions, cooperation, developments, business climate. A unique aspect of the Northern Netherlands is the close collaboration between the chemical clusters in Emmen and Delfzijl. Together, they form the second largest chemical cluster in the Netherlands. A sustainably developed industrial area for chemical related companies who exchange raw materials. Specialized in making fiber. Focus on polymers and materials.